Hog Roast Bristol were delighted to be asked to recently cater at the wedding of Rachel and Paul at Farrington Memorial Hall in Bristol. Here at Hog Roast Bristol, we clearly understand that a couple’s wedding is one of the most important events of their lives and we always ensure that our service is professional, friendly and high quality and with precise attention to detail. We are aware that there are many good caterers for this type of event but what makes us great, is this meticulous attention to detail and the high quality of our food and service. 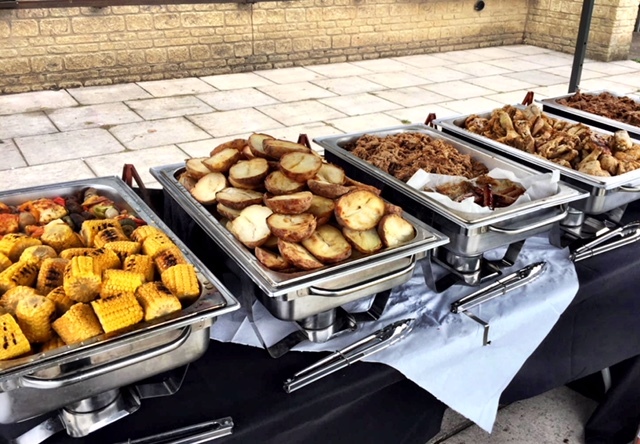 Hog Roast Bristol has a wide selection of menus available for wedding events ranging from an entry level option through to more formal options with evening buffet options too and we know that the choice of menu for this type of event is crucial to its success. For this occasion, the client wanted our Southern Slow Roast Menu with Cajun Chicken, Creole Lamb and Texan Brisket with corn cobettes, jacket potatoes and coleslaw. This was for the 75 adults but the couple also wanted something suitable for 12 children that would be there and we suggested sausages in hot dog rolls. Adaptability, flexibility and planning area fundamental parts of our seamless service and once we arrived at the venue, we liaised with the organisers to discuss the arrangements and began to set up; the room looked fabulous! Preparation is the key to success for any event but especially for a wedding as there is so much going on and everyone wants to enjoy the day rather than worrying about things going wrong, hence we always ensure that meticulous planning and preparation occurs to ensure that all expectations are met and we were very clear on what time we needed to arrive and to set up to be able to cater for the guests. We started up the hog roast around an hour before serving; once the hog roast was up to temperature, the guests arrived for their food with many commenting how tasty it was and how amazing the crackling tasted and Hog Roast Bristol were very proud to be part of this fabulous day. Copyright © 2019 Spitting Pig South West . All Rights Reserved.